I've been meaning to tell everyone about my favorite local (Kansas City) supplier of wool roving, yarns, and many other fiber art related materials. The name of the shop is Cottage Fiber, and its wonderful shopkeeper and owner is named P.J. She is such a lovely and knowledgeable person to talk to about all fiber arts; although, her specialty is spinning and weaving. I'm sure that she'd even give you a little intro to spinning if you asked or, perhaps, even offer full-service classes if that's what you wanted. She carries top quality rovings of all kinds, hand dyed yarns, professional dyes, spinning and weaving equipment, as well as a variety of other fiber art supplies. I just visited her shop on Saturday and bought these beautiful batts of hand dyed, carded wool fiber that P.J. made herself. They are a mixture of mainly merino with various other fibers added for texture and color. I haven't quite figured out what to do with them yet. After all, they are just so very pretty as they are! I buy the vast majority of my wool roving and fleece from Cottage Fiber. 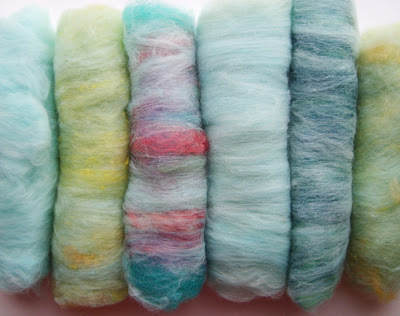 So if you're a feltmaker, weaver, spinner, knitter, or crocheter and like the colors, patterns, and textures that you see in my items, then go to Cottage Fiber to find fabulous materials for making your own handspun yarns, hand felted items, and other fiber arts. One of my favorite things to do is to visit Cottage Fiber with its wonderful, yummy variety of fibers! Recently, P.J. relocated her shop to the Crossroads District, an area of Kansas City known for its fabulous art galleries and diverse culture. 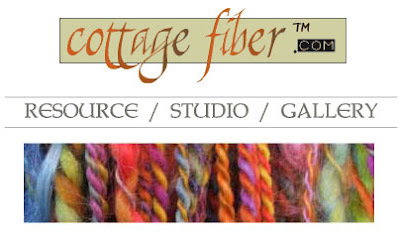 Please check the Cottage Fiber website for directions to her brand new location. It is *definitely* worth an afternoon or morning outing to see Cottage Fiber's impressive collection of fiber art supplies and finished items as well as have a chat with P.J.